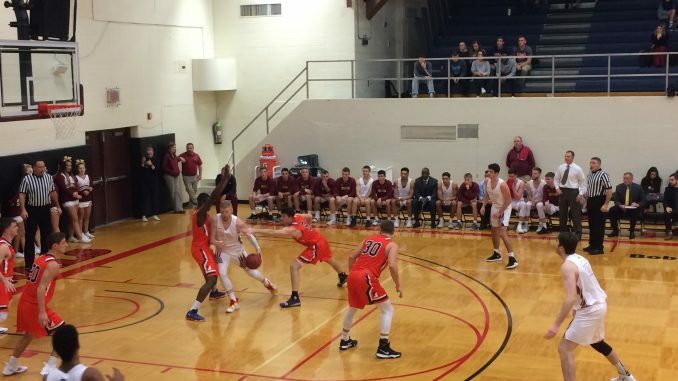 The Fisher’s men’s basketball team sealed a 3-1 record on Tuesday Nov. 27 after a fast-paced 91-81 victory against the Hobart and William Smith Statesmen on Bobby Wanzer Court. Four players for the Cardinals scored in double digits, including freshman Matt Asenjo, with a team-high 23 points. The first five minutes of play started with a series of layups for both teams, keeping the score close at 8 – 8. Hobart responded with three-pointers, bringing the score to 15 – 12. Cardinals’ sophomore Sammy Robinson was subbed out for the rest of the half, after a technical foul and personal foul. However, the Cardinals came back with rebounds and a steal that helped to set up a six-point run. Sophomore James Leone kept the Cardinals’ momentum with three buckets and two points at the line, keeping the score close. With three minutes left in the half, Hobart pulled ahead by five points with the help of guard Colin Dougherty, who led all scorers with 32 points. The Cardinals were able the finish the half with two baskets to keep the game close, making the score at the half 36-34 in favor of the Herons. Leone was the top scorer of the half, with 12 points and Asenjo wasn’t far behind with 10 points. Robinson came back in the second half with 13 points and eight rebounds. Buckets from Leone and junior Ryan Henderson helped to tie the game and a layup from Robinson put the Cardinals ahead 40-38. Asenjo’s momentum, along with Robinson’s rebounds, helped to extend the Cardinals’ lead to 50-43, after a long range three-pointer by Asenjo. Cardinals’ Junior Ryan Henderson also helped to extend the lead by driving the ball for two layups. With eight minutes left in the half, Hobart tried to close the gap, after Dougherty and junior Sam Allen had a series of buckets, making the score 59-62. To counter, Robinson and Asenjo worked together to raise the score to a more comfortable 10 point lead with five minutes of play left. The Cardinals managed to keep their lead with the clock winding down by earning points at the line and with the help of a three-pointer from junior Jordan Gilman. Asenjo tied with Robinson for most points scored in the second half after making two free throws. The Cardinals secured their win when freshman Sean Williams scored three points at the line, making the final score 91-81. The Cardinals’ next game will be at home against the University of Rochester next Thursday, Dec. 6.